A SpaceX Falcon 9 v1.1 rocket launches the SES-8 commercial communications satellite into orbit from Cape Canaveral Air Force Station in Florida on Dec. 3, 2013. The mission is SpaceX's first commercial satellite launch into a geostationary transfer orbit. A SpaceX Falcon 9 rocket lit up the night sky over Florida Tuesday (Dec. 3) in a landmark communications satellite mission that catapulted the private spaceflight company into the commercial launch business. 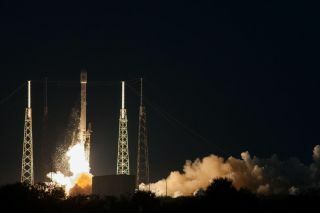 The upgraded Falcon 9 rocket launched into space from SpaceX's pad at Cape Canaveral Air Force Station in Florida on a mission to deliver the 3.2-ton SES-8 communications satellite into orbit. The liftoff at 5:41 p.m. EST (2241 GMT) marked SpaceX's first entry into the large commercial satellite market and its first launch into a geostationary transfer orbit needed for such a mission. "We've had a great launch today," SpaceX Falcon 9 product manager John Insprucker said just after liftoff. Another major milestone for SpaceX occurred 27 minutes after liftoff, when the two-stage Falcon 9 rocket reignited its second stage for a maneuver that delivered the SES-8 satellite into its intended orbit. An attempt to perform the maneuver during a September test flight of the upgraded Falcon 9 failed due to a frozen igniter fluid line, a glitch SpaceX engineers fixed with the addition of insulation to the affected system. "Spacecraft separation confirmed!" SpaceX officials wrote in a Twitter post 33 minutes after launch. "SES-8 is now in its targeted GEO transfer orbit." SpaceX's billionaire CEO and founder Elon Musk was exultant. A SpaceX Falcon 9 v1.1 rocket streaks toward space carrying the commercial SES-8 communications satellite. The mission launched Dec. 3, 2013 from Cape Canaveral Air Force Station in Florida and is SpaceX's first commercial launch into a geostationary transfer orbit. "Restart was good, apogee raised to 80k km (50k miles). Yes!!!" Musk wrote on Twitter. The 6,918-lb. (3,138 kilograms) SES-8 satellite was placed in a transfer orbit that ranges between 183 miles (295 kilometers) above Earth at its nearest point and 49,709 miles (80,000 km) at its highest point. The satellite is a hybrid Ku-and Ka-band spacecraft built to provide high-definition telecommunications services to SES World Skies customers across the South Asia and Pacific region. The smooth launch is a landmark achievement for SpaceX's plans to provide reliable and affordable launch services to commercial satellite operators and government space agencies. SpaceX has already demonstrated the dependability of its baseline Falcon 9 rocket with the repeated launch success of its unmanned Dragon space capsule. Today's mission marked SpaceX's seventh Falcon 9 launch since 2010, all of them successful. The Hawthorne, Calif.-based company has a $1.6 billion deal with NASA to launch its unmanned Dragon capsule on 12 cargo delivery missions to the International Space Station; two of these missions have already flown. The company is also developing a manned version of Dragon to ferry astronauts to and from the International Space Station. The second stage engine on SpaceX's upgraded Falcon 9 v1.1 rocket glows red with the blue airglow of Earth's atmosphere in the background during the company's launch of the SES-8 communications satellite from Cape Canaveral Air Force Station, Fla., on Dec. 3, 2013. But to launch commercial satellites, SpaceX upgraded the 224.4-foot (68.4 meters) Falcon 9 rocket to boost its capabilities. The rocket's nine-engine first stage was modified with new SpaceX Merlin 1D engines that provide more thrust than their predecessors. The rocket has a larger 17-foot (5.1 m) payload fairing to fit even the largest satellites inside, and boasts a triple redundant avionics system for reliability, company officials said. The first Falcon v1.1 launched on Sept. 29 from SpaceX's pad at Vandenberg Air Force Base in California on a mission that successfully carried the CASSIOPE space weather tracking satellite into orbit for the Canadian Space Agency. SpaceX engineers also changed the configuration of the first-stage engines, which were in a three-by-three block, into a circular "Octaweb" pattern with eight engines encircling the ninth to increase reliability and streamline its manufacturing process, company officials said. SpaceX has also outfitted the upgraded Falcon 9's first stage with heat shielding and a restart capability as part of its ongoing project to develop a completely reusable rocket launch system. "We've done everything we can think of to maximize the reliability of this launch system," Musk told reporters on Nov. 24, one day before the first launch attempt. "We're really happy with this rocket design, and it's an incredibly capable vehicle." SpaceX's Falcon 9 rockets are named after the fictional Millennium Falcon spaceship from the "Star Wars" films. The Dragon spacecraft are named after the fictional Puff the Magic Dragon, SpaceX officials have said.